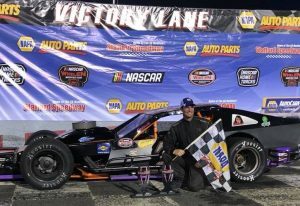 On Aug. 19, 2008 Mark Bakaj got his fourth victory of that season at Stafford Motor Speedway in the SK Light Modified division. Friday at Stafford the Lebanon driver got that career victory total up to five wins. Just under 10 years since last win in the division at Stafford, Bakaj held off the field on a green-white-checkered finish to win the 20-lap SK Light Modified feature Friday at Stafford Speedway. Wesley Prucker of Stafford was second and Bryan Narducci of Colchester third. Bakaj has been a fixture near the front of the field for much of the season in his Gino Difilippo owned RH2Way – Super Clean sponsored ride. Bakaj was able to keep Prucker and three-time winner this season and division points leader Bryan Narducci at bay on the final restart. Glen Reen of Wilbraham, Mass. got his second victory of the season in the 30-lap Late Model feature. George Bessette Jr. of Danbury got his third win of the season in the 20-lap Street Stock feature. Brandon Michael of Granville, Mass. was second and Meghan Fuller of Auburn, Mass. Duane Provost of Palmer, Mass. got his second win of 2018 in the Limited Late Model feature. Jeremy Lavoie of Windsor Locks was second and Ryan Fearn of East Longmeadow, Mass. third. A blown sk lite engine??? Not a good day for the Jet- Congratulations to HPH racing and Mark!! First just for the record Stafford was not the first to have a sportsman modified division. They got the idea from the Southern New York Racing Association who set the first very successful one up at the Danbury Racearena. And they did it for all the good reasons Stafford has been the recipient of. Hold on Tanto, the anointing of Narducci as champion will have to wait until the season is run. A funny thing happened between the start of the season when he consistently had unbeatable lap times and mid season…………competition. You remember the accusations of cheater engines and mom cherry picking tires. All gone. 7 cars were faster then Bryan Friday night. Actually Bryan got where he ended up by really superb driving. The LM’s are a refreshment and potty break, the stars are the SK’s but the SK Lights are the most competitive field where it is virtually impossible to predict a winner. Do what the SNYRA did Stafford. Make the Lights the second division with more money and fame. They earned it and I have to believe the fans support it as well. There has been a sportsman modified for ever. Sportsman modified used to race with the Modifieds – seperate points, trophy and purse. Then what do you think the sk’s were? No doubt the skl need a bigger purse and a cheaper engine and smaller and cheaper tire. Won’t be long before the skl’s become the top division but they will keep the purse down. One fan’s opinion: Purse money and race length should be based more on car count. When you have a category running a consi to set the field, they should be running for more purse money and more laps than half full fields. My apologies to the Stafford LM’s and LLM’s, but with 10-12 cars on a 1/2 mile track, a 15-20 lap race should be sufficient. SKL’s should be able to run 25-30 laps. ACT rules might help the LM’s car count. I always get a kick out of the back seat passenger in the 76 SKL. Great to see it in victory lane. Congratulations! I went to bat for Danbury since I grew up with that track and wanted to get some interest from other fans. As I recall Waterford had straight 6’s around the same time so there’s that. I can’t believe I’d take issue with anything Eddie says but here’s my 2 cents. You could argue that the purse needs to be sized to encourage participation period They have the cars for sure and the competition is terrific so why give them a raise? I’ll tell you why. Because fans love the Lights as far as I can see and sometimes you simply have to recognize one of your major assets to keep it being an asset. That means a raise and making them the second division.